I love to teach math concepts hands-on and there’s nothing more engaging than an edible treat! Any edible treat that comes in two different designs, colors, or sizes could be used for this activity. 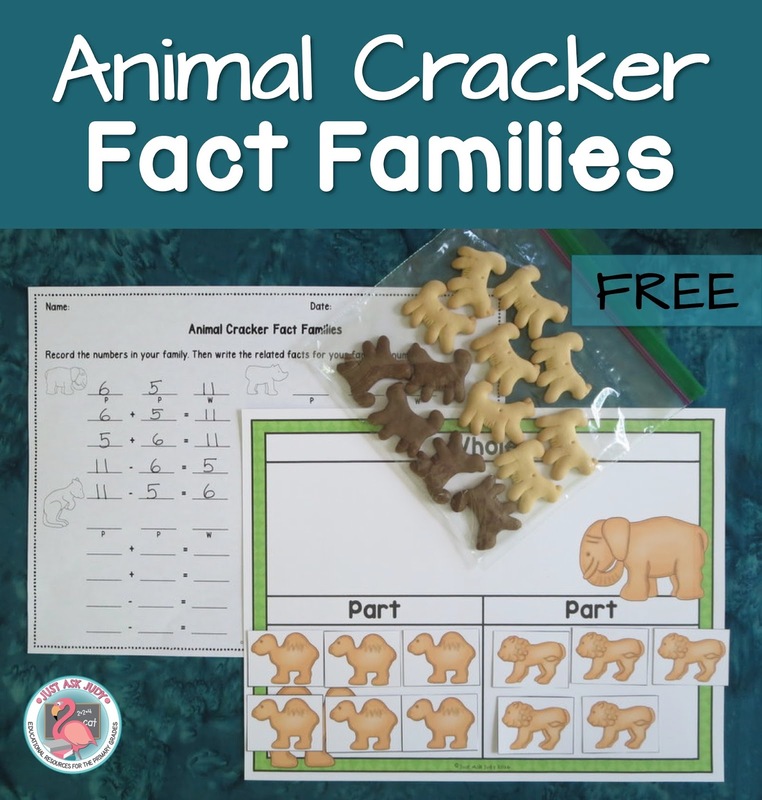 Animal Cracker Fact Families is a hands-on, engaging way to introduce or practice addition and subtraction fact families. Using a part/ part/ whole mat helps to develop a conceptual understanding of related facts. This flexible activity can be used for direct instruction with a whole class, a small group, or individuals or for an independent math center. You can print on card stock and laminate for durability or simply print on paper for short term use. Print either the color or black/ gray/ white animal cracker part/ part/ whole mats (one per child). 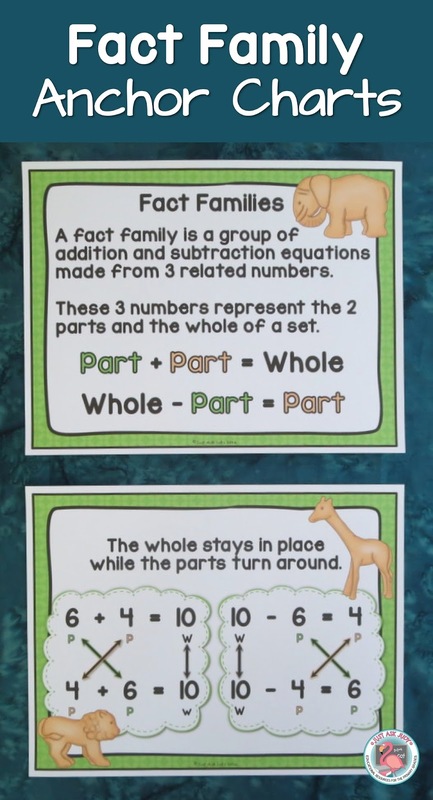 Print the two color fact family anchor charts and the color or black/ white animal cracker counters, if using. You will need to sort and bag animal crackers. Sandwich baggies are perfect for this. Each child needs 10 each of two different animal cracker designs, sizes, or flavors (for facts to 20). I found chocolate animal crackers at the grocery store and mini ones at a bulk food store. Print the recording sheets, if using. Have a list of 3 related numbers for addition and subtraction (i.e. 6, 3, 9) ready. Be sure to include doubles and zeroes (7, 7, 14; 8, 0, 8). Give each kid a mat and a baggie of presorted animal crackers. Have them show the whole, then each part of the whole on their mats. Model, by moving the animal crackers, how the parts equal the whole beginning with either part and how to write the two related addition equations. They may write these on whiteboards or the recording sheet. Model how the whole minus each part equals the other part. Then write the two related subtraction equations. Repeat the activity several times with different sets of related numbers. 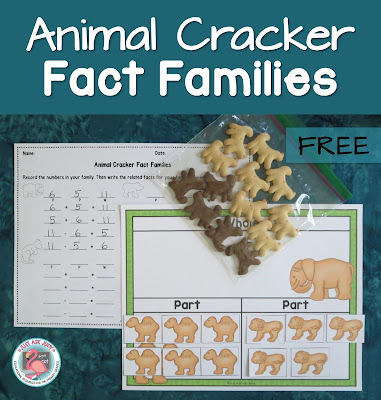 For a center activity, you can place selected numbers of animal crackers or counters in baggies or empty animal cracker boxes. If you use quart size bags, the animal crackers can be manipulated within the bag. For example, use 3 elephants and 8 camels or 6 vanilla and 4 chocolate. Your kids choose a set and write the family of facts on the recording sheet, using the part/ part/ whole mat, as needed. Don’t forget to set aside a few animal crackers for little nibblers! 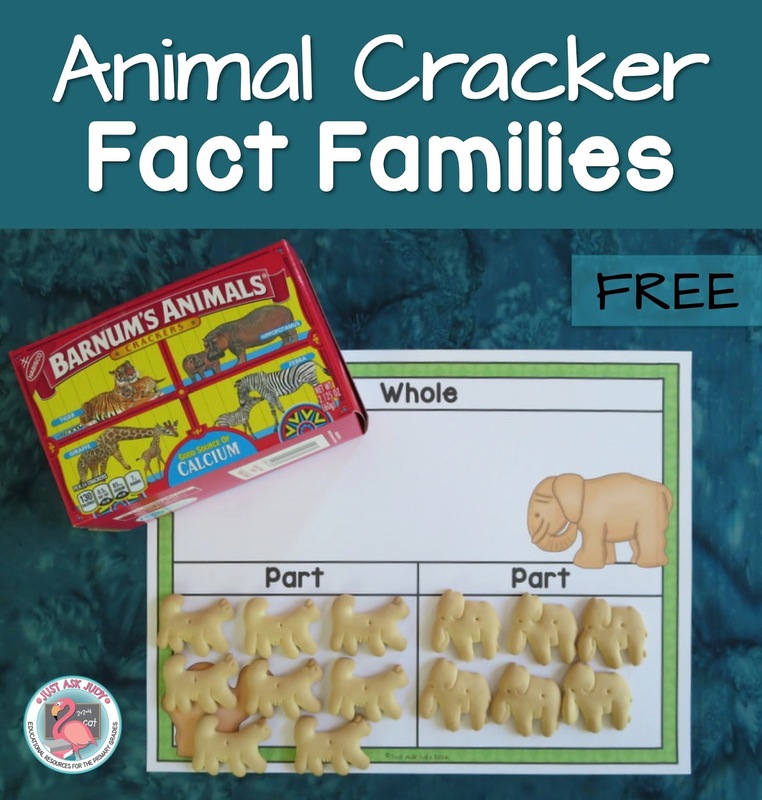 Animal Cracker Fact Families can be downloaded for free. Just click on the link. Whenever possible, math instruction should flow from concrete to pictorial to abstract. National Animal Cracker Day is April 18th. Animal shaped cookies were first imported from England in the late 1800’s, quickly gaining popularity in the United States. Stauffer’s Biscuit Company from York, PA, still in business today, made their first animal crackers in 1871. 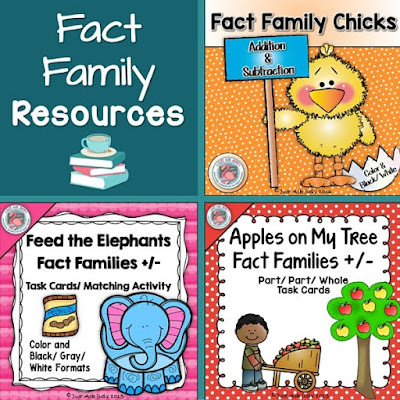 You might also be interested in these fact family resources available in my TpT store. Just click on the picture. Love this freebie and the anchor chart visuals. Thanks for linking up!